If you know me, you know I live for recycling and repurposing. You also know that I live for crafting. When both of those passions collide in one project, I’m one happy mama. You may remember that I get together once in a while with my friend, J., for crafting. 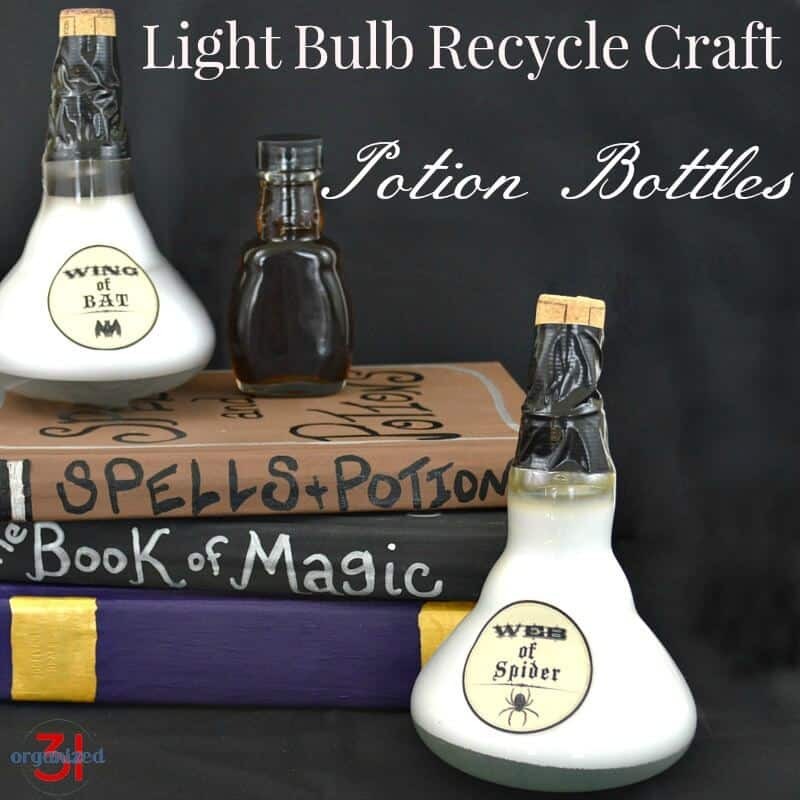 She kindly brought me the idea and all the items I needed to make this light bulb recycle craft that is perfect for Halloween or anytime you need DIY potion bottles. 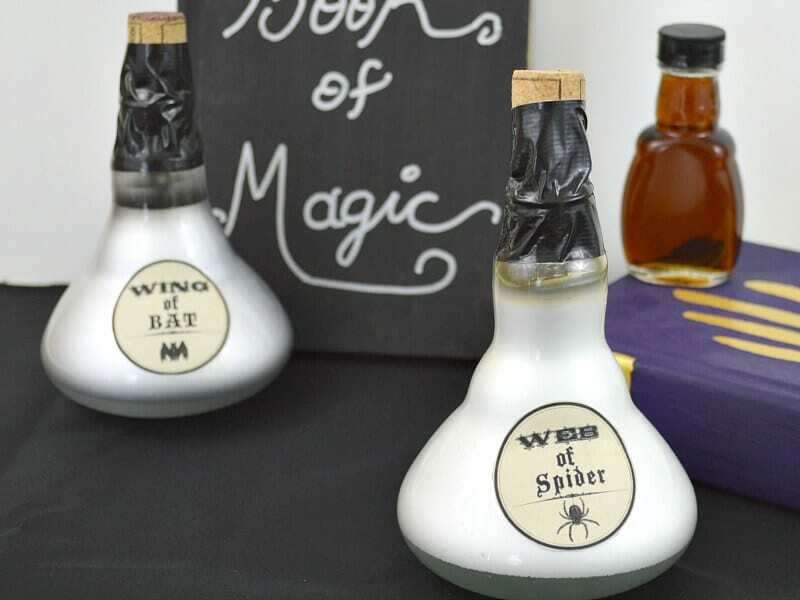 These upcycled potion bottles make great Halloween decorations, party decorations, props for imaginative play or a drama performance. 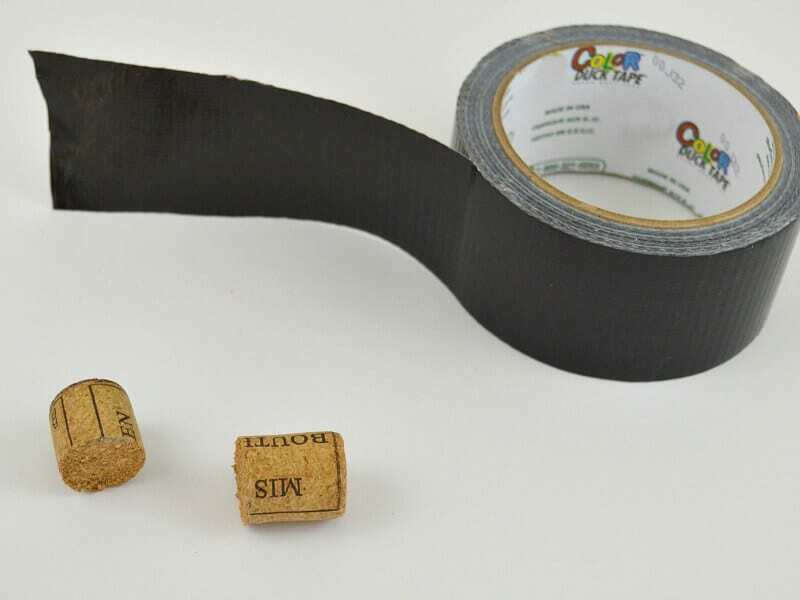 Duct Tape – In black, gold or silver. Labels – I found mine at The Graphics Fairy. You can download the images for free. Print your chosen labels out on printer paper or card stock paper. Cut the labels out. Decoupage the labels onto the light bulbs. I prefer the matte look of the paper, so I only use the decoupage glue on the back of the label. 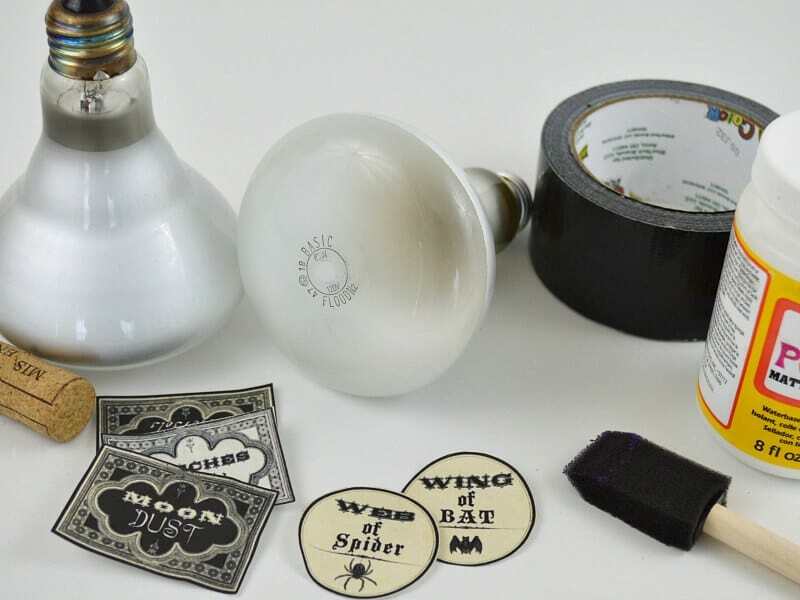 If you want to make the labels more durable, paint the decoupage glue on the front of the label once you’ve adhered it to the light bulb. Carefully cut the cork in half. I used a bread knife and a cutting board (or to be honest, my husband used a bread knife and cutting board). You can use the cork in it’s original size, but I prefer the proportion of the smaller piece of cork to the height of the light bulb bottle. 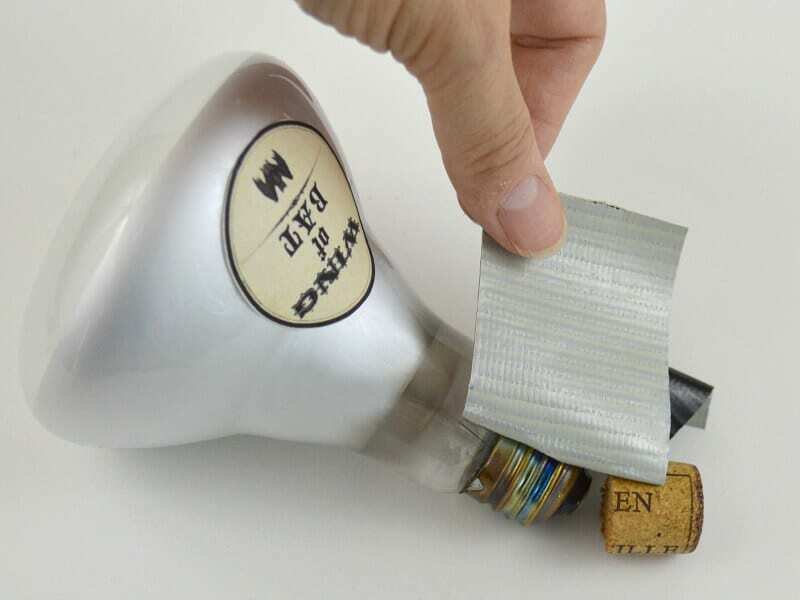 Use a strip of duct tape to attach the cork to the top of the light bulb bottle. Take time to make sure your cork is centered and upright on the top of the bulb. This is the most difficult part of the craft since the light bulb end is curved. Just fuss with it a bit and the cork will stay straight and then press the tape tight to hold it there. 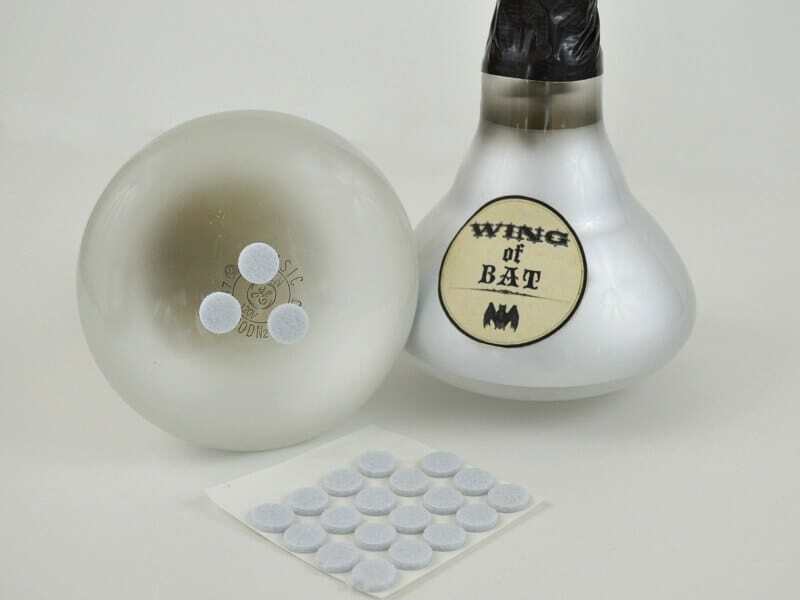 It bothered me that the potion bottles didn’t stand up straight because the bottom of the light bulb is curved. I simply added felt pads to the bottom of the light bulb to stabilize the light bulb bottle. It only took about 15 minutes to make these repurposed light bulb potion bottles and cost me nothing since all the supplies were things I already had (thanks to my friend, J., for the used light bulbs). This would be a great kids craft. Be sure to supervise children closely since the light bulb is very fragile. Doesn’t this light bulb recycle craft look great with my recycled book Halloween decorations? And, yes, I’d love all your used light bulbs so I can make more of these upcycled potion bottles. Ok, these are adorable. I love all things holiday… and look at this clever way to reuse those big old lightbulbs. Terrific one, Susan! Thanks, Seana. You know my obsession for repurposing items. Happy Halloween! Such a great idea for burned out bulbs!! Thanks, Dianna. It’s such an easy craft that packs a big punch. What a clever way to repurpose old floodlight bulbs! 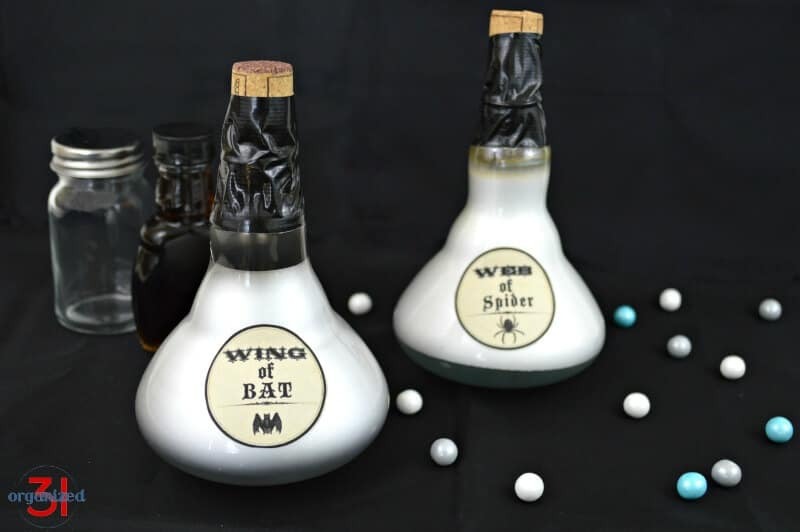 The potion bottles turn out so cute. Such an inexpensive and practical way to decorate for Halloween. Thanks for the tutorial! I am getting ready for a Halloween spread. These would look perfect on my buffet table! Thanks for the great idea. Can’t wait to see your Halloween decorations, Stacey. It’s such a fun holiday, isn’t it. 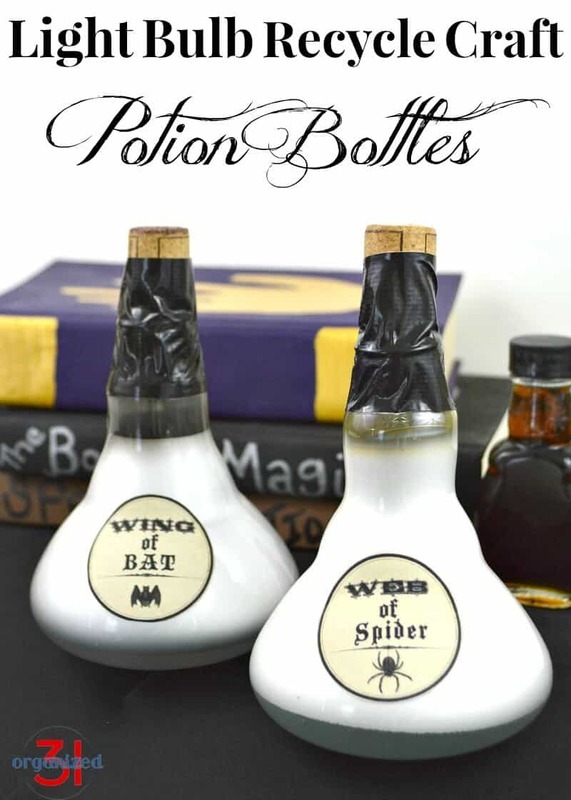 I am loving these Potion Bottles. I can see myself making a few of these and adding them to my mantle this Halloween! Such a great way to use old light bulbs. LOVE these! What a perfect use of old lightbulbs to get into the Halloween spirit. I am really inspired by how you upcycle items and transform them into perfect décor. What an adorable Halloween display! I so adore halloween – the decorations and the costumes are such fun. Thanks, Monica. I’m with you. Halloween can be such a fun holiday. This is such a fun craft and perfect for a Halloween party. Very creative I would have never thought of this.